Ren Yi (任頤, 1840–1896), better known by his courtesy name as Ren Bonian (任伯年), was a painter of the Qing dynasty. He was born in Shaoxing (紹興) of Zhejiang Province, but after the death of his father in 1855 he lived in Shanghai. This move placed him in a more urban world that was exposed to Western thinking. In Shanghai he became associated with the Shanghai School which fused popular and traditional styles. Ren Yi was noted for his bold brushstrokes and use of color. 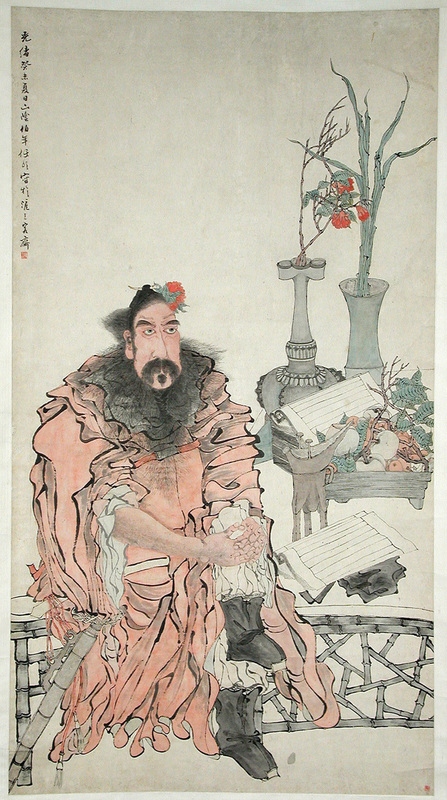 He is regarded the most outstanding one of the “Four Rens”—the other three “Rens” are two of his uncles and one of his cousins, who are all notable painters. Ren Yi is well-known for his figure paintings. It is said that when his was about ten, one of his father’s friends came to visit when his father was out. When he returned and asked who the visitor was, Ren Yi did not know the name but managed to draw a portrait, from which his father was immediately able to tell who it was. Ren Yi’s achievement in flower-and-bird painting probably even surpassed that of his figure painting. In his earlier career the Song Dynasty painters influenced him, but later on he favored a freer style influenced by the works of Chen Chun (陳淳), Xu Wei (徐渭), and Zhu Da (朱耷).